HISTORY | KEN Real Estate Lease Ltd.
"Continental Lease Ltd.," Ken Corporation’s first affiliate company, was established in Roppongi, Minato Ward, Tokyo, Japan. Name of "Continental Lease Ltd." changed to "Kenpo Ltd."
Notation of "Kenpo Ltd." changed in Japanese. Investment in capital: 20,000,000 yen. Head office relocated to 1-5-7 Azabudai, Minato Ward, Tokyo, Japan. Head office relocated to 1-2-7 Nishi-Azabu, Minato Ward, Tokyo, Japan. Name changed to "Ken Real Estate Lease Ltd."
Increased capitalization to 20,000,000 yen. Office building lease business initiated with purchase of Shibuya Center Building. Head office relocated to 1-3-10 Nishi-Azabu, Minato Ward, Tokyo, Japan. Acquired "Embassy Suites Hotel Lake Tahoe Resort" (Currently "Lake Tahoe Resort Hotel"). Increased capitalization to 50,000,000 yen. Acquired "Renaissance Sapporo Hotel" (Currently "Premier Hotel -TSUBAKI- Sapporo"). Acquired "TOKO CITY HOTEL Matsumoto" (Currently Premier Hotel -CABIN- Matsumoto"). Acquired "Aqua Resort Club Saipan." Acquired "TOKO CITY HOTEL Umeda" (Closed for rebuilding in 2015). Acquired "Hotel PACO Junior Susukino" (Currently "Premier Hotel -CABIN- Sapporo"). Acquired "Kanazawa Hakuchoro Hotel" (Currently "Kanazawa Hakuchoro Hotel Sanraku"). Head office relocated to 1-2-7 Nishi-Azabu, Minato Ward, Tokyo, Japan (Same building as the Head Office of Ken Corporation). Established the Hotel Business Department. Hotel business under Ken Corporation is transferred to this Department. Acquired "Hotel JAL City Nagano." Acquired "Sheraton Anaheim Hotel" (Currently "Anaheim Majestic Garden Hotel"). Acquired "Pacific Island Club Guam." Acquired "Hotel Arthur Sapporo" (Currently "Premier Hotel Nakajima Park Sapporo"). Acquired "Hotel JAL City Aomori." Re-branded and re-opened "Novotel Sapporo" (formerly "Hotel Arthur Sapporo"). Opened PHR KOREA (Korean Office) in Seoul, South Korea. Opened Premier Hotels & Resorts Korea Ltd. (Currently PHR Korea, Ltd.). Acquired "Palace Hotel Guam" (Currently "Sheraton Laguna Guam Resort"). Opened PHR GUAM (Guam Office). Opened "P.H.R. Ken Asset Management, Inc." (Currently "PHR Ken Micronesia, Inc."). Acquired Golf course "Country Club of the Pacific (CCP)" (Guam). Acquired "Luke Plaza Hotel" (Nagasaki City, Japan). Reopened "Sheraton Laguna Guam Resort." Acquired "Hotel Castle" (Yamagata City, Japan). Acquired "Hilton Guam Resort & Spa." Opened PHR Management, Inc. (North American Office). Acquired "Pacific Island Club Saipan." Increased capitalization to 100,000,000 yen. 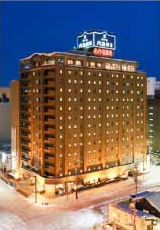 Acquired "Hotel Paco Asahikawa" (Currently Premier Hotel - CABIN- Asahikawa" and "Hotel Paco Obihiro (Currently Premier Hotel -CABIN- Obihiro)." Acquired "Hotel Tor Road" (Currently "Kobe Tor Road Hotel Sanraku"). Acquired "Mojiko Hotel" (Currently "Premier Hotel Mojiko"). Re-branded "Kobe Toa Road Hotel Sanraku" and "Kanazawa Hakuchoro Hotel Sanraku." Launched the New "Premier Hotel -TSUBAKI-" brand, "Premier Hotel Group"
Re-branded "Anaheim Majestic Garden Hotel" (formerly "Sheraton Anaheim Hotel"). Opened "Hyatt Regency Naha Okinawa." Re-branded "Premier Hotel -TSUBAKI- Sapporo" (formerly "Renaissance Sapporo Hotel"). Acquired "Hotel Vintage Shinjuku" (Currently "Premier Hotel -CABIN- Shinjuku"). Acquired "Loisir Hotel Hakodate" (Currently "Four Points by Sheraton Hakodate"). Real Estate Department relocated to 1-3-10 Nishi-Azabu, Minato Ward, Tokyo, Japan (within Ken Corporation's annex building). Re-branded "Premier Hotel Nakajima Park Sapporo" (formerly "Novotel Sapporo"). Simultaneously re-branded all facilities in "Premier Hotel -CABIN-"series (locations are in Sapporo, Asahikawa, Obihiro, Shinjuku and Matsumoto). Acquired "JAL Private Resort Okuma" (Currently "Okuma Private Beach & Resort"). Re-branded "Premier Hotel Mojiko" (formerly "Mojiko Hotel"). 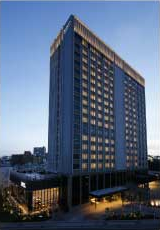 Re-branded "Loisir Hotel Hakodate" into "Four Points by Sheraton Hakodate". Acquired "RIHGA Royal Gran Okinawa". Opened "Premier Hotel -CABIN- Osaka" (formerly "TOKO City Hotel Umeda"). Re-branded "Okuma Private Beach & Resort" (formerly "JAL Private Resort Okuma").